ESPN personality Stephen A. Smith will be warming the bench this week. The sports network suspended Smith for one week on Tuesday for televised remarks he made last week seeming to suggest that victims of domestic abuse sometimes shared responsibility for physical assault. Smith has apologized several times for comments he made Friday on the sports debate show First Take, where Smith and fellow ESPN personality Skip Bayless discussed the two-game suspension the NFL levied on Ravens running back Ray Rice. Surveillance cameras from an Atlantic City casino showed Rice dragging his unconscious bride-to-be, Janay Palmer, out of an elevator, days before their marriage. Smith tried to quell the outrage in a series of posts on Twitter, then in a longer statement, and finally in an on-air apology broadcast on Monday morning. 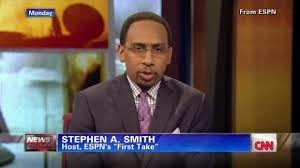 After ESPN’s decision, Smith (@stephenasmith) tweeted out: My apology on @ESPN_FirstTake Monday morning speaks for itself. I accept ESPN’s Decision. See you all next Wednesday. God Bless! My apology on @ESPN_FirstTake Monday morning speaks for itself. I accept ESPN's Decision. See you all next Wednesday. God Bless! Overall I like Stephen A. Though the First Take commentary is annoying to me when they get on the hot topics outside of sport. I think they should discuss this topics but something just doesn't set right with me about their delivery sometimes. Anyway, I was wondering what exactly he said. I saw alot of comments about it on Twitter. Now I know. My perspective is that women can physically abuse men and do damage. When that does happen the woman should be held to account. However, more often than not, domestic violence is man on woman. A football player is physically stronger than average man. How much stronger is he than the average woman? And the NFL player is trained on being physically aggressive to excel on the field. He clearly can do more damage with one shot. I don't care how much a woman nags, runs her mouth, and even disrespects a man nothing justifies him putting his hands on her. Even when paparazzi provoke celebrities, purposefully, the celebrity cannot retaliate by striking the person. This idea of provocation is a copout. If a person wanted to screw you over for real and all they have to do is provoke and bait you into violence, then it's on you for being ensnared because you will bear the brunt of the consequences. That being said, self-control is one thing. Having a core belief that you don't put your hands on a woman or anyone is another. And too many people think there is justification for doing so and that attitude has to change.